Early logging in Clearfield County historically brings to mind rafts and log drives to Williamsport and Marietta by way of the Susquehanna River. 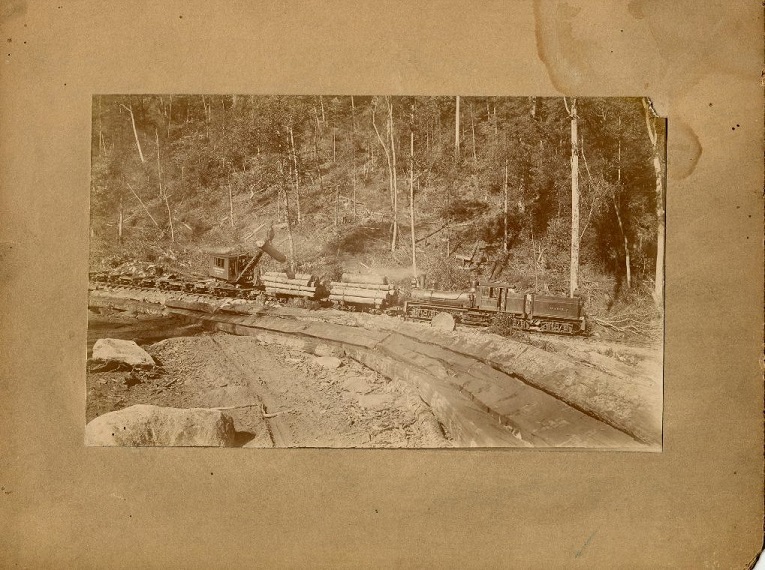 During the later decades of this once booming resource economy, newly-built railroads hauled both logs and coal. A number of railroads were funded and built by entrepreneurs and corporate investors in order to successfully compete with the mighty Pennsylvania Railroad. One such rail line was the Beech Creek Railroad that was founded in 1882. Its local investors included U.S. Senator William Wallace, Israel Test and E.H. Bigler, along with others such as S.R. Peale and Joseph Gazzam, who both had once thriving mining communities named for them. The Beech Creek was leased to and then operated by the New York Central Railroad. The Beech Creek line ran from Peale, in Cooper Township, to Clearfield, and then on to Mahaffey, roughly following the paths of the Susquehanna River and Little Clearfield Creek, through Ferguson and other central county townships. The photo shows full logging cars being loaded near Kerrmoor in Ferguson Township. It is likely an early 20th century view, showing modern heavy equipment of the time.